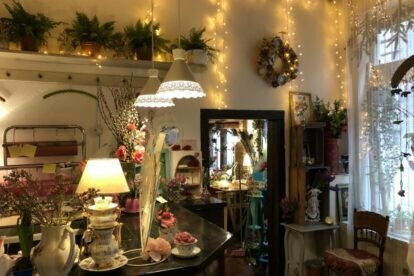 Very recently, a new pop-up flower shop opened in an ancient building where there used to be a restaurant. I always thought flowers are sold in a trendy, clean, modern shop. This pop-up flower shop gives you a whole different perspective. When you enter, you are instantly thrown back 50 years into the past. The manager of the shop, a lovely young lady, has original ideas to help you create beautiful flower pieces. Here you can buy a flower bouquet for example presented in an old tea pot, next to a retro sofa. Except for the flowers, all items are original pieces that she found on flea markets or second-hand shops. Therefore, prices are lower than you would expect from a themed shop like this. On the upper floor there are exhibitions from time to time. Painters or photographers show off their work, or you can participate in an art workshop yourself. Since this is an early one-woman-only-diy-pop-up-shop, not a lot of information can be found on the internet yet, so you will have to ask for information directly at the shop.